We offer the finest vinyl pet doors available. Your pet can safely step in and out whenever he or she wants to. Great for all pets from small cats to large dogs up to 80 pounds. The attractive white vinyl construction is sturdy and never needs to be painted. The doors fit snugly next to your vinyl sliding patio door and insulates better than metal framing. Our vinyl pet doors come in custom sizes and are specifically designed to fit any height vinyl sliding patio door track widths between 1-1/2” and 1-3/4”, which is what is common in most newer or remodeled homes. Many have been successfully installed alongside Pella and Andersen vinyl sliding patio doors, as well as other manufacturers. The clear vinyl flap is available in two sizes. The medium door flap measures 7” x 11-1/4” for a total width of 12-1/4”. The rise (the part that your pet steps over to get in and out) is 4”. The overall door height is adjustable from 76-3/4 to 78-1/2”. The extra large door flap measures 10.5” x 15” for a total width of 16-3/4”. The rise is 6”. The overall door height is available in any size. Our doors are energy efficient, available with single pane, dual pane, or dual pane Low-E tempered glass panels. The optional Low-E coating reflects IR heat from inside the room to help reduce the energy loss during the cold months, thereby reducing heating costs. The single pane is perfect for mild climates. For more extreme temperatures the dual pane glass provides extra insulation. The dog door uses the existing lock already on your sliding glass door. For added security a slide-in lock-out panel is also included, so you can keep your pet inside or outside when needed. All vinyl dog doors fit on the left or right side of a vinyl sliding glass door and are easy to install. The door panel fits snugly into your existing sliding door frame and attached with Velcro, that is hidden inside the door jam, so there are no visible screws. 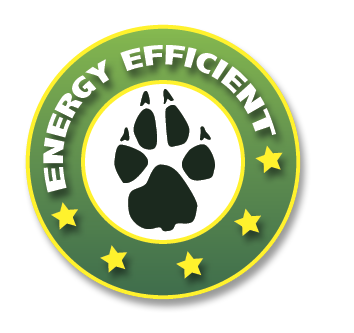 All vinyl pet doors are backed by a limited lifetime warranty.